A photo-edition named "Fountain/Blue Version" has been made of the performance "Fountain". The edition is shot in a business lobby in Berlin, which is elegantly arranged in blue tiles on the wall and marble floor. This place represents different social issues such as, actual capitalism with all its potential for crisis. This photo-edition of "Fountain/Blue Version" reflects the combination of space and art. 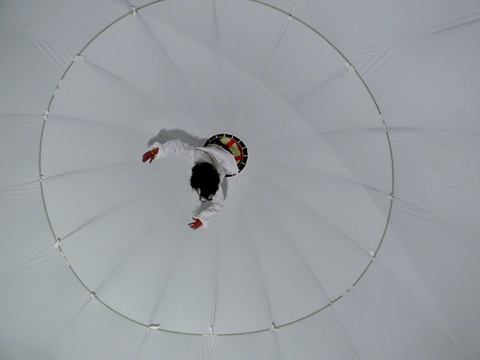 The videoinstallation "veil battle" consists of two big projections. Both Close up projections of the head show an Islamic woman (artist Nezaket Ekici) in a Tschador. In the left projection the artist tries to unfix the veil in fast movements of the head. The veil waves force before the face up and down, so the viewers only get to see the face for a fraction of a second. In the difficult battle between bare and not she undress continiously but slowly from the veil. The video ends when the veil is off and repeats in a loop. The right projection shows the same subject. Here the Artist in contrast to the left projection tries to free the veil without use of force in a difficult Sisyphus work from the head. The artist folds the veil millimetre by millimetre. 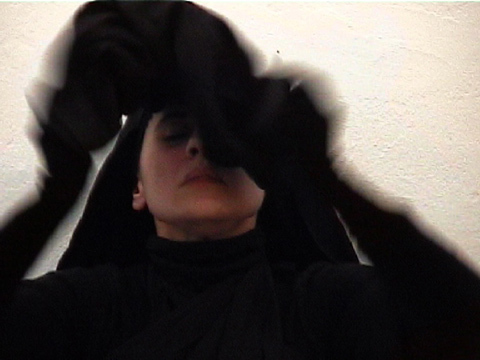 The video ends, when the veil becomes is off. The video begins again in a Loop. 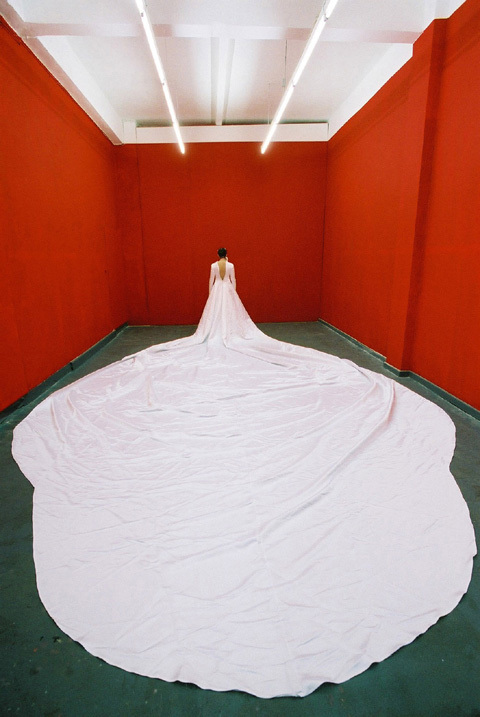 The Artist (Nezaket Ekici) stands with the back to the viewer, in an created red colored room, with a wedding dress 8 meters long and 6 meter width. She tries to pull up desperately in Sisyphus work the long zipper in the back. Because the dress is closely sewed on purpose in the sleeve, shoulder and hip, it will be impossible to come up with the zipper. By using microphones, the noises of the zipper and breathing become audible. During 30 minutes, the viewer is torn whether he should help or not. In the end the Artist stops undone things with an open back and leaves the room with her long train. With the video Instillation "National Anthems", Nezaket Ekici explores the universal topics of identity and nationality by offering personal renditions of the national anthems of Germany and Turkey. She intends to illustrate the social and political implications inherent in cross-cultural divides using her self as the vantage point. Ekici is an artist constantly confronted with the duality imposed by two cultures as she was born in Turkey and raised in Germany. She sings the Turkish national anthem using the melody of the German national anthem and vice versa to illustrate a new empathic understanding of cultural integration. The two national anthems overlap but are not used by the artist to undermine the national pride of either nation. 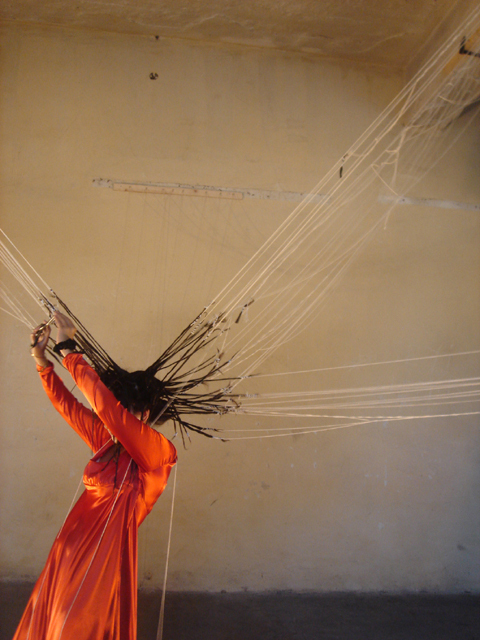 Ultimately the performance represents a personal reflection of the difficulties and complexities involved in the process of cultural interchange. In the Video Performance "Hullabelly" the artist, veiled by a headscarf, in trousers and skirt, moves with a hula-hoop to Oriental belly dance music. She uses only her head to rotate the hoop. With "Wachtraum/Daydream" Nezaket Ekici abducts the viewer into a latent dream world, where reality appears in many variations. 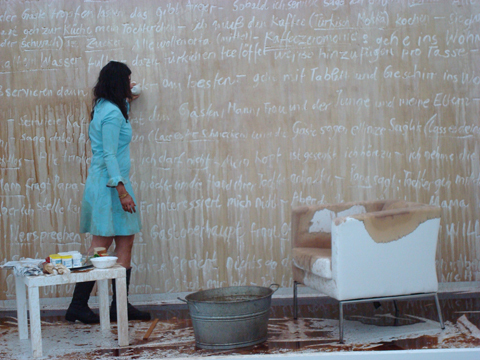 She links her live-performance to a nearly simultaneous video mirroring and thus creates an atmosphere of the absurd.